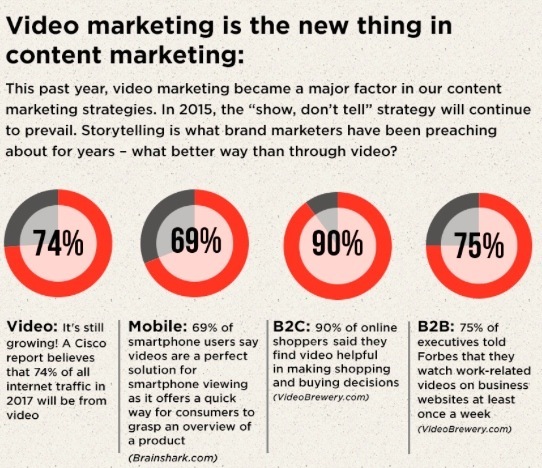 2015 is going to be a big year for those who dig into the use of video in their marketing strategy. The data and evidence continues to grow on the benefits of what I call “V-Marketing” and the early adopters are seeing a clear advantage. Below is a snippet & link from a recent post by Shama Hyder’s Marketing Zen Group that talks specifically about the need for video as part of a successful marketing strategy. 9 Ingredients Every CMO’s Recipe Needs For Success in 2015. So the real question is, will you be ahead of the marketing strategy curve in 2015?